Of the photos from my recent Seattle trip, this is likely my favorite. 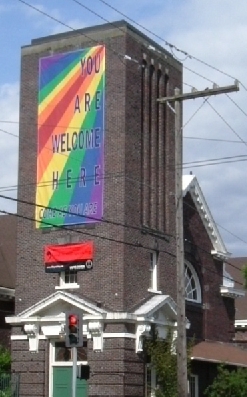 A rainbow banner proudly displayed on All Pilgrims Christian Church. It says, "You Are Welcome Here." "Come as you are." A good thing to see in a district of the city with so many different kinds of people. Gay, non gay, rich, poor, young, old, not to mention so many different races, nationalities, interests. Looking on the web, I saw that this church was listed among the open and affirming congregations in Washington State for gay and lesbian people.